Staff and students from Durham Catholic District School Board (DCDSB) secondary schools participated Oct. 18 in the third annual conference The Leader in Me: Awareness to Action. 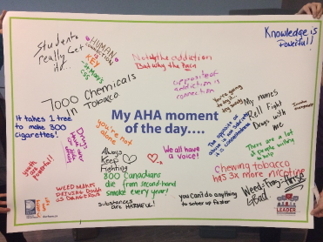 Organized by the Durham Youth Drug Awareness Committee (DYDAC), the student conference shared facts about substance use and mental health, to begin preparations for an in-school health promotion campaign supported by their Public Health Nurse. DYDAC is a collaboration between the DCDSB, the Durham District School Board, Carea Community Health Centre, Pinewood Centre of Lakeridge Health, Durham Region Public Health and Durham Region Police Service. DCDSB Mental Health Leader Diane Mullane opened the day with an overview of some key mental health messages, as well as general information about the connection between mental health, substance use and school connectedness. Then, Jeff Gauthier, Senior Addiction Counsellor from Durham Amaze Early Psychosis Intervention Program, led a thought-provoking keynote speech on addiction during which he challenged students to consider potential reasons and solutions for addiction. Jeff offered students one major “aha moment” when he said “the opposite of addiction is not sobriety, it’s connection;” he explained that many people use substances not just to feel good, but to avoid painful feelings. After the keynote, students attended three information sessions led by our community partners at Pinewood Centre, Carea Community Health Centre and Durham Region Public Health, during which they learned about alcohol, marijuana, tobacco, opioids and over-the-counter medications. Participants then met with their school’s Public Health Nurse to discuss their health promotion campaign. Students were encouraged to think about the connections between the topics at the conference. They also considered ideas such as merging some of their initiatives, for example, into a mental health week or a campaign promoting belonging as a way to prevent problematic substance use and addiction. Students showed a lot of enthusiasm during this planning session, and most schools left the conference with a scheduled date for their next meeting. When their plans are complete, schools can apply for up to $200 in funding from DYDAC to run their health promotion campaign. DYDAC committee members said they are eager to support the school initiatives, and excited to learn more about the student plans.